I came across this acrobatic beetle whilst walking along the banks of the river Rede in Northumbria in June 2008 whilst looking for Dippers. 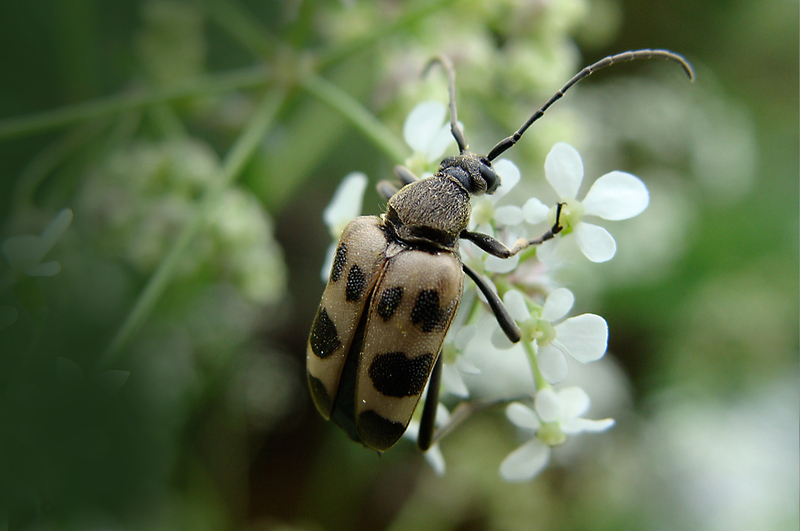 It’s a type of Longhorn flower beetle Judolia cerambyciformis found mainly in hilly and mountainous areas – this specimen was photographed on the edge of Keilder Forest. The larvae feed on the roots or the rotting wood of deciduous and coniferous trees before pupating below ground. The adults are between 7-12mm in length and are usually encountered on flowers from May to August. It’s a nationally scarce species so it was an unexpected bonus to find it. The species gets the name longhorn or long-horned from its very long antenna which are often longer than the body. You’ve probably gathered by now that I’m fond of coleoptera (beetles). Beetles make up about 40% of all insect species, 25% of all life-forms, and are by far the biggest insect group with around 370,ooo described species worldwide – there are certainly many, many more still to be identified. We have over 4,000 species in Britain, 1,500 in Wiltshire alone so I’ve quite a way to go. Many thanks once again to the marvellously knowledgeable Ian Beevis @TWBC_Museum for help with the identification. You and me both. It’s been a long winter here in England and we have more snow forecast this weekend.This time last year I was photographing butterflies. Ah, my fave… the beetles. I am so posed for spring it is unreal. It’s weird not taking out specimen pots and we are into April. I’d like a bumper crop this year with them all having to hold out for the warm sun! Yep, beetles have slowly become my favourite too. I’m kinda getting cabin fever now. It’s just starting to snow, again! One can only hope that when winter does finally loosen its grip Spring will come with a vengeance.